The global market for chronic kidney disease drugs continues to proliferate at a significant pace, driven by the increasing number of chronic kidney disease patients and the growing need of novel treatments to improve patients’ quality of life. The increasing number of elderly people, who are more vulnerable to various diseases due to poor immunity, such as cardiovascular disorders, diabetes, and neurological conditions, is another important factor behind the growth of this market, as, owing to this, the prevalence of these diseases is rising considerably across the world. Going forward, the market is projected to be propelled substantially in the near future by the technological advancements, leading to the development of a wide array of drugs, which will enable clinicians to provide proper assistance to chronic kidney disease patients. The global chronic kidney disease drugs market stood at US$11.5 bn in 2015. Burgeoning at a CAGR of 3.60% between 2016 and 2024, the market’s opportunity is expected to reach US$15.8 bn by the end of 2024. The global market for chronic kidney disease drugs is studied on the basis of a number of parameters, among which the drug class is a prominent one. Based on the drug class, the market is classified primarily into ACE Inhibitors, Angiotensin-II receptor blockers, calcium channel blockers, beta blockers, erythropoiesis-stimulating agents (ESAs), and diuretics. Calcium channel blockers surfaced as the key drug class in 2015, leading the market with a share of 18.9%. Currently, the main calcium channel blockers utilized across the world are benzothiazepines (diltiazem), phenyl alkyl amines (verapamil), and dihydropiridines (nifedipine and amlodipine). Hospitals and specialty clinics are the prime end users of chronic kidney disease drugs. The hospitals segment, which is the current market leader, is expected to continue its dominance in this market over the next few years. The worldwide chronic kidney disease drugs market is stretched across North America, Europe, Asia Pacific, Latin America, and the Middle East and Africa. North America led this market in 2015 with a share of 31.8%. Driven by the strong economic condition of the region and the high acceptance for advanced technology products, the North America chronic kidney disease drugs market is likely to maintain its lead over the forthcoming years. The increasing cases of diabetes and obesity related disorders are also projected to boost this regional market in the near future. Europe, which was the second leading market for chronic kidney disease drugs across the world in 2015, is likely to present the most attractive growth opportunities to market players in the years to come due to the increasing pool of kidney cancer patients in this region. The high rate of adoption and usage of superior quality treatments for these diseases is also predicted to aid the Europe chronic kidney disease drugs market over the next few years. The significant expansion of the medical and healthcare industry in China, Japan, and Australia is likely to drive the Asia Pacific market for chronic kidney disease drugs in the near future. Teva Pharmaceutical Industries Ltd., Amgen Inc., AstraZeneca Plc, Pfizer Inc., F. Hoffmann-La Roche Ltd., Sanofi S.A., GlaxoSmithKline Plc, AbbVie Inc., Kissei Pharmaceutical Co. Ltd., and Keryx Biopharmaceuticals Inc. are some of the leading makers of drugs for the treatment of chronic kidney diseases across the world. This report on the global chronic kidney disease (CKD) drugs market analyzes the current and future prospects of the market. The report comprises an elaborate executive summary, including a market snapshot that provides overall information of various segments and sub-segments. The research is a combination of primary and secondary research. Primary research formed the bulk of our research efforts along with information collected from telephonic interviews and interactions via e-mails. Secondary research involved study of company websites, annual reports, press releases, stock analysis presentations, and various international and national databases. The report provides market size in terms of US$ Mn for each segment for the period from 2014 to 2024, considering the macro and micro environmental factors. Growth rates for each segment within the global chronic kidney disease (CKD) drugs market have been determined after a thorough analysis of past trends, demographics, future trends, technological developments, and regulatory requirements. A detailed qualitative analysis of factors responsible for driving and restraining market growth and future opportunities has been provided in the market overview section. This section of the report also provide insights into the key trends of the chronic kidney disease (CKD) drugs market such as novel treatment approaches such as monoclonal antibodies, RNA-based therapies and stem cell based therapies. The key market indicators influencing global Chronic Kidney Disease (CKD) Drugs market taken into consideration including cost constraints and regulatory landscape. The report also includes market attractiveness analysis of the major segments that provides a thorough analysis of the overall competitive scenario in the global Chronic Kidney Disease (CKD) Drugs market. The report also highlights key events of the global Chronic Kidney Disease (CKD) Drugs industry. A porter’s five force analysis highlighting competitive landscape is also included in the report. Market revenue in terms of US$ Mn for the period between 2014 and 2024 along with the compound annual growth rate (CAGR %) from 2016 to 2024 are provided for all the segments, considering 2015 as the base year. The year on year growth of global Chronic Kidney Disease (CKD) Drugs market for each segment is also reflected. Additionally, market related factors such as increasing preference for product innovation, and cost reduction for hospitals and greater affordability for patients in various geographies and historical year-on-year growth have been taken into consideration while estimating the market size. Based on product type, the global Chronic Kidney Disease (CKD) Drugs market has been segmented into ACE Inhibitors, Angiotensin-II receptor blockers, Calcium channel blockers, Beta blockers, Erythropoiesis-stimulating agents (ESAs), Diuretics, and Others. Based on end-user, the market has been segmented into hospitals and specialty clinics. Hospitals segment is expected to remain dominant during the forecast period. 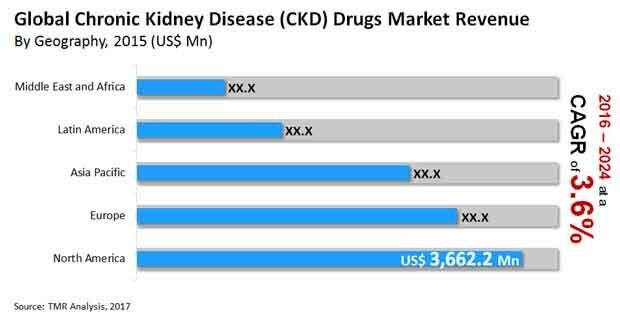 Geographically, the global Chronic Kidney Disease (CKD) Drugs market has been segmented into five regions: North America, Europe, Asia Pacific, Latin America, and Middle East & Africa. In addition, the regions have been further segmented into major countries from each region. These include the U.S., Canada, the U.K., Germany, France, Italy, Spain, China, Australia, India, Japan, Brazil, and Mexico. The report also profiles major players in the Chronic Kidney Disease (CKD) Drugs market based on various attributes such as company overview, financial overview, SWOT analysis, key business strategies, product portfolio, and recent developments. A thorough market share analysis of major companies operating in the Chronic Kidney Disease (CKD) Drugs market is provided in the report. Key companies profiled in the report include Keryx Biopharmaceuticals, Inc., Kissei Pharmaceutical Co., Ltd, AbbVie, Inc., GlaxoSmithKline plc., Sanofi S.A. , F. Hoffmann-La Roche Ltd., Pfizer, Inc., AstraZeneca plc, Amgen Inc., and Teva Pharmaceutical Industries Ltd.